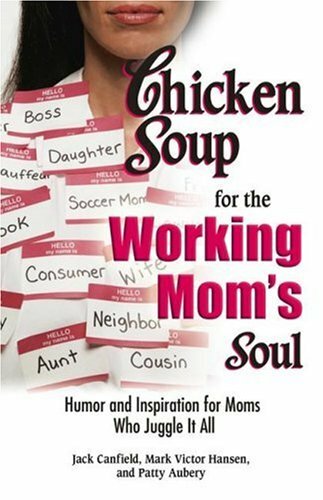 I recently stumbled across Chicken Soup For The Working Mom’s Soul when I was researching books about being a working mom. I hadn’t picked up a Chicken Soup/Soul book in many years and was taken back by the many, many books that are now part of the series. No matter the issue or challenge you are facing, they have some chicken soup for it. You name it, they’ve got it! While the authors most likely are not in need of another review, I wanted to pass this along to you because it’s a great resource. Chicken Soup For The Working Mom’s Soul is not just for moms who head out to an office each day. It includes stories for all moms. We are all busy juggling the demands of motherhood! The book is filled with inspirational, funny and touching stories. You can pick and choose what you want to read because it has over 80 short essays. Listed below you will find the the table of contents. Want a good laugh? Take a look at Balancing on page 216. I’m sure we all have a funny story about the morning chaos. You’ll want to read this one! For a different perspective a la attitude with gratitude in the essay titled The New Age To-do List will give you an ah-ha moment found at page 212. Check out a touching story about Making Memories with your family, even on a week day! You can find one mother’s sweet story on page 67. I love hearing and reading the stories of moms and dads who balance the ebb and flow of parenting with the goal of giving all that is possible to their families. It’s truly inspiring. With such sacrifice, we can all use a little chicken soup soul nourishment along with a pat on the back for the great job each and every one of us do. It’s worth the read, the laugh and the different outlook you will gain from the true stories of these amazing women (and a couple stories from husbands). How do manage it all? I used to be very hassled when I started working after my girl turned 18 months. In fact, I fell sick after 10 days in an attempt to be superwoman. On a lark I picked up “Chicken soup for the working mom’s soul”. The stories are all from abroad, but I have realized that mothers (and working mothers more so) are a cult. We face the same issues, same choices, same dilemmas, same guilt and same pangs. Reading the book has helped me get a perspective, relax and regain my sense of humour. I am enjoying my work and kid better. All moms (working at home or outside) must try to get hold of it (I am usually not the audience for self-help books, but this one really helped me).